I was fairly groggy as Maddie decided to wake us up twice during the night barking her crazy little head off. She's been doing that the past few nights. Good times. The sky was starting to get light so I put on my Brooks Nightlife arm band because I thought that'd be more visible than extra blinking lights (which I had one on). Not fully functioning and too warm from the start, my first mile was slow. But I was ok with that. No worries. I kept telling myself, "it's good to slow down, this will be good." But I did start to hit a good rhythm. However, the arm band was randomly pinching me so I kept having to move it around. Still, moving along at a good clip. 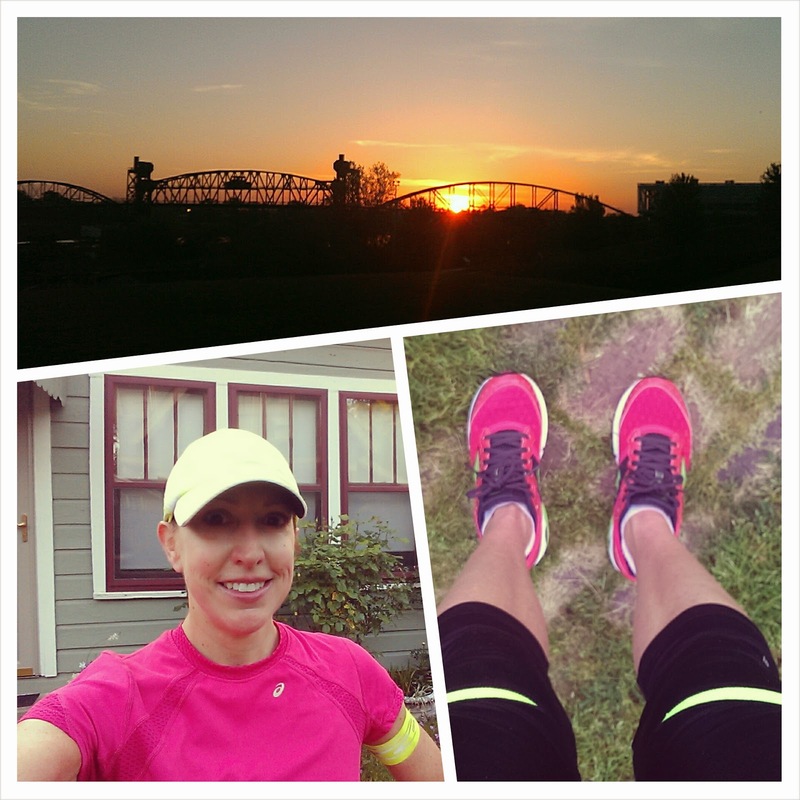 I decided to make it a tempo run (or attempted tempo). Then I noticed a clicking sound as my Spibelt kept riding up and shifting about. It does that when I wear tights. Very very annoying. I kept pushing it back down, tried tightening it. Still the clicking. I kept checking the location of the light and mace to see what they might be clacking on. Nothing I could find. (I later realized the pants had a back pocket with a zipper that was clacking on the closure for the belt.) I kept running ... shoving down the Spibelt, readjusting the armband, checking for the clacking ... but running. Then my watch band shifted and started to pinch. Great, one more thing to add to the list of shifting belt, pinching armband and clacking noise. Oddly enough, focussing on those annoyances left me not thinking one bit about my pace, about the humidity and difficulty breathing, which turned out to be a bonus. With each mile of shifting, pinching, clacking and sweating, I was speeding up. Trying to run away from the annoyances? When I got near the river I stopped to soak in the sunrise. I know some people refuse to stop during a run, I don't usually like to, however, I think it's important to enjoy the beauty first and foremost. I took that stop as a chance to readjusted everything once more, wiped the sweat from my stinging eyes and kept on going. Despite all of the shifting, pinching, clacking, I managed to end with an 8:15 overall average for 7.3 miles. My "tempo" miles never quite hit a true tempo pace, but I managed to get some sub-7's. And for readjusting to humidity and warmer temps, I'll take that in a heartbeat. I do (now) find it a bit amusing that all those annoyances I was so focused on actually helped me out. I didn't allow them to control the run entirely. I could have. I could have gotten angry about it. I could have let it affect my overall mood. Have you ever had a generally annoying workout but one that was also somehow good? I just had a run where the sound of the key in my pocket was annoying me so much. I tried carrying it in my hand but that annoyed me even more. With all my focus on the key, I was done with my run before I knew it!